Log detailing construction of my Easy 32 Catamaran. Use the archive to see how things have progressed. Click on "Posted by Tony" to contact me. Someone has suggested that catamaran construction has gone virtual! Well, I suppose it has been a while since the last update. That's mainly because a couple of unexpected things came along: Due to a broken cap shroud, I had to take the mast out of Papillion for refurbishment. Papillion almost has an electric toilet and holding tank. Also, it's taken a bit of time to get the kombi into serviceable condition (brakes, steering, engine tuneups). 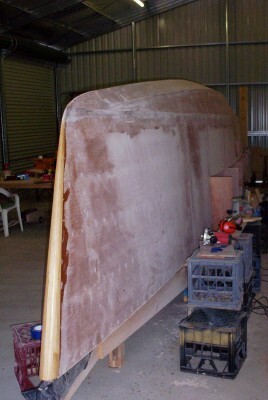 I've also had some problems trying to get epoxy to stick to the spotted gum I selected for the bottom of the mini keels. I think the timber may actually have been treated with some CCA replacement. Anyway, today I'm buying some different hardwood. Something gets done every day. The whole hull is sheeted, and I've done an initial fairing prior to glassing. The bow is shaped. Some of the chines are rounded ready for glassing. The outboard pod is ready to glue in place. I've taken delivery of the stove and sink for the galley & checked them for size.